The post for May 11 . . . Cheers, to my dinner companions of May 14: Kathy, Elaine, Jill, Joann and Jane. May we all get packed in time for the bus trip in the morning. First a correction: It's Sarlat-la-Canéda (not "en"), and then we're staying in Sarlat, the city. Sarlat-la-Canéda refers to other aspects of jurisdiction which includes surrounding villages in some manner that our guide today, Françoise, deemed important. Regionally, we're in the Dordogne-Périgord. It's a highly-scenic tourist destination (including French, not just foreigners), and contains a place I have forever wanted to see -- the caves at Lascaux, with their breathtakingly beautiful wall paintings by prehistoric man. That's on our itinerary for tomorrow. Today we got a taste of other attractions in the Dordogne. 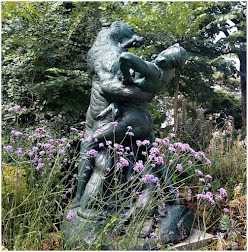 Tour guides in France are amazing repositories of their nation's vibrant history, but their detailed descriptions flow through me like a river, with only a few eddies soaking in. Those are the impressions that linger with me about a place and it'll be mostly those that I'll describe. If you want facts and details, you can consult our friend, Google. We began the day with a walking tour of the Old Town of Sarlat, Françoise in the lead. Wednesday is market day and venders were still setting up in the narrow streets and tiny courtyards as we arrived. Our group of 18 was probably the smallest of the many tour groups clogging the streets today. "Up here you have ..."
Old towns in French cities tempt exploration; rough cobblestone paths and streets and skinny stairways abound, so watch your step. In the history of a building, you find one rich man or family trying to outdo another in opulence, to impress the poor and improve their own status. Buildings begun centuries ago change hands and are renovated over and over to add grandiosity. The system for dividing of these holdings is incomprehensible, but provides surprises around every corner. I'd love to have time to get lost in and then find my way back out of Old Town, any Old Town. Many us Americans think of things this old as monuments to history and objects for public protection and/or ownership. Many of the French national treasures are in private ownership, acquired for a token one franc in earlier years, one euro now, in return for restoration and, I believe, public access. (Not free, but public.) I was once told that France is so rich in ancient treasures that there is no way for the nation to afford to protect them all; thus they seek benefactors. 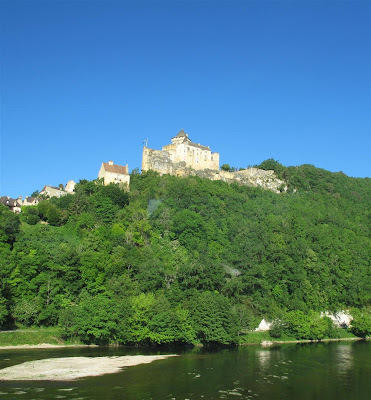 Later in the morning, we met up with our bus and driver Carlos, to travel along the Dordogne river to Chateau de Castelnaud, which means New Castle. On a knoll overlooking the Dordogne, the chateau was already at the center of battles in the early 13th century. If this is new, how old must something be to be old! It was listed as a Historic Building in 1966 at the request of its new owners who rehabilitated it and it's now a Museum of the War of the Middle Ages. We had a tour of the exhibits, climbing flight after flight of tight spiral stone staircases, ill-lit, steep, so narrow I often had not much more than a toehold on a step. But what beautiful vistas over the countryside from the many levels, interesting exhibits of ancient armaments, and the buildings themselves, built for defense. The higher we climbed, the worse my thighs burned. Others complained more of cramping calves. So how (shudder) were we going to get down? Fortunately for all, there was another way out. Whether of modern build during a renovation, or for the Ladies who once resided in the chateau over the centuries, there was an easier, better lit staircase to take us out. I managed to pick my way down without incident. End of Part 1 . . . Due to heavy photo content, the rest of May 11 is in Part 2. I have been to Sarlat, too! it's gorgeous. I am so glad you get to visit this beautiful part of France. Jealous! I've always wanted to see Sarlat and its surroundings. Great pictures!